Captured in the photos above - the last stone column being installed on site and the Project employee shuttle in action. Stone column installation was completed in early May, with over 3,700 installed on site. Stone columns were selected as a quieter and less vibration-causing method of ground improvements. A total of 8,500 truckloads of barged material were transported to site for this activity. Over 17,000 truckloads of barged material have been delivered to site for pre-load. Pre-load prepares the ground for the new plant by replicating the future weight of the facility with a large pile of sand and gravel in advance of constructing the foundation. Barging aggregate materials to nearby water access and trucking a short distance to site significantly reduces transportation impacts and overall operating times. Over 3,800 trips on the employee shuttle. The shuttle was implemented late last year to provide a connection between North Shore transit hubs and the Project office to reduce the number of individual vehicle trips by Project staff. On August 31 Metro Vancouver hosted a Project ground-breaking event. ACCIONA and its project partners would like to thank the North Shore communities for their patience and cooperation as we work to build this important piece of infrastructure. 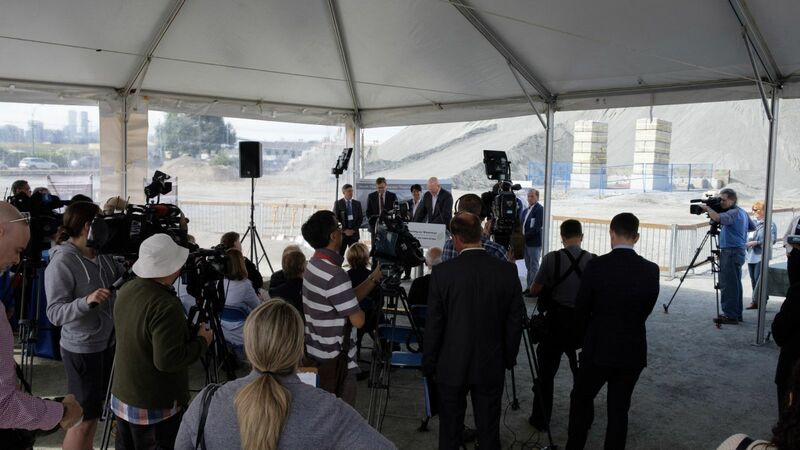 Below - Metro Vancouver ground-breaking event held on August 31. Representatives from municipal, provincial and federal governments in attendance along with Squamish Nation. If you've driven, cycled or walked down West 1st Street recently you may have noticed the new Project fencing. The artwork featured on the fencing has information about ACCIONA and the Project, including renderings of the future plant. The fencing is designed to withstand weather and construction processes, serve as a screen to improve the site aesthetic and reduce potential distractions for the travelling public. Metro Vancouver filmed key transportation initiatives undertaken by the Project as part of their sustainable solutions video series. ACCIONA is committed to being a good neighbour during construction. Finding creative solutions such as barging materials and implementing an employee shuttle are key initiatives undertaken in the Project's first year. Metro Vancouver filmed key transportation initiatives undertaken by the Project as part of their sustainable solutions video series. Above - images from the design model of process equipment inside of the plant. Do you know what a secondary clarifier is? This integral part of the secondary wastewater treatment process allows solids to settle and separate from the effluent in the system. The products created during this process (activated sludge and effluent) move through the facility for further treatment. Last year Metro Vancouver confirmed that a District Energy System will be built into the final plant design. 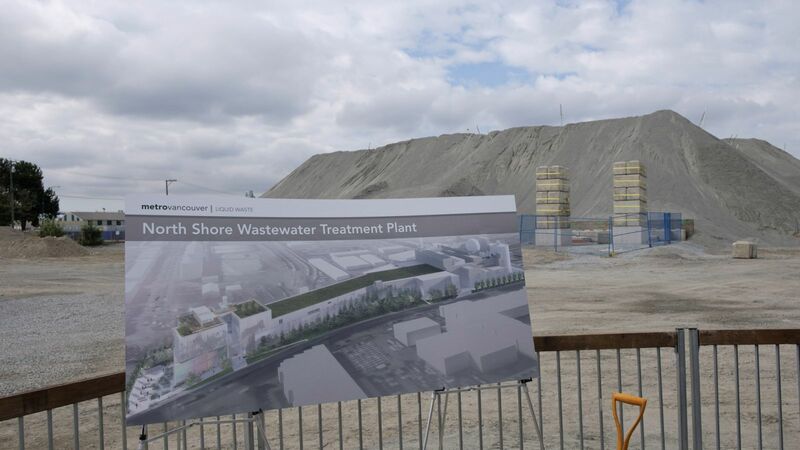 This will allow heat generated by the wastewater treatment process to be turned into energy and sold to the Lonsdale Energy Corporation for heating. The integration of this heat recovery system is expected to reduce greenhouse gas emissions by 7,200 tonnes per year and will reduce the Lonsdale Energy Corporation's reliance on natural gas for heating. This is one aspect of the Project's resource recovery strategy. Have you visited our website recently? We've added a photo gallery to highlight site activities. You can always find the latest Project updates, newsletters and Project information on the website. Thank you for your continued interest in the North Shore Wastewater Treatment Plant Project. This newsletter is intended to provide updates and additional details about the Project. We will continue to provide regular updates of upcoming work. If you have any questions, comments or suggestions regarding the Project, please contact the Project's Community Liaison Officer at community@accionadbjv.ca.